Please tell me I’m not the only one obsessed with school supplies and desk accessories. 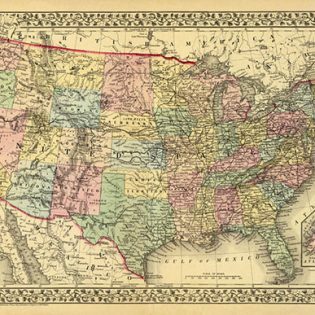 There are SO many great designs and options out there right now, but it can all quickly add up to a rather costly obsession. So when Scotch Expressions (3M) contacted me and asked me to create a project with their super adorable new line of Scotch Expression Tape for Back-to-School (#ScotchBTS), I knew exactly what I wanted to do! Since I don’t want to sacrifice style for my budget, I went thrifting and hit up Target for a few office supplies that I could customize myself to give my high school senior a stylish and organized homework station, without breaking the bank. I found an adorable metal tray and wooden box that had some great detail to them and would be perfect on a desk. I took them home and gave them a few coats of glossy white spray paint —-once they were dry, the fun began….pretty tape! 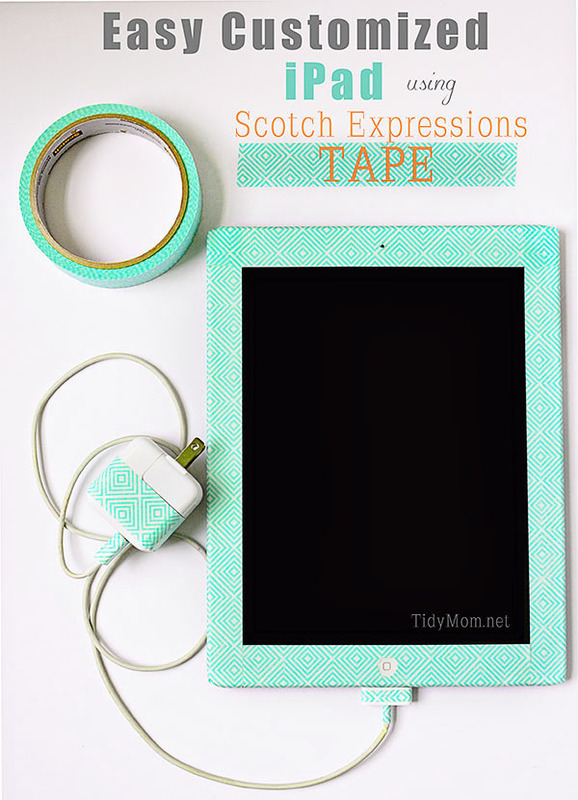 Have you seen the new Scotch Expressions Tape? They have so many amazing colors and designs of washi tapes, masking tapes, shipping tapes and more! What’s great about decorating this way is, the tape is so easy to remove if you decide to change your color scheme some time down the road! No need to buy new supplies, you can just change out the tape for a whole new look. 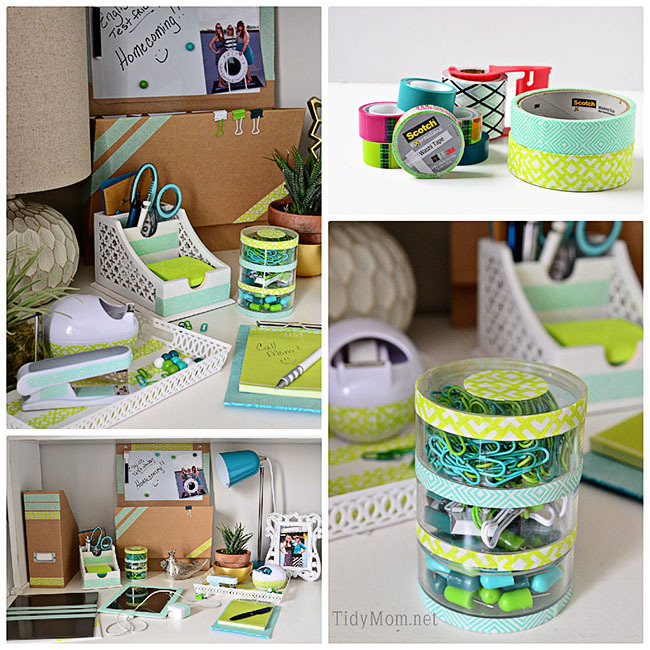 I then added some of the Scotch Expressions tape to the desk supplies; a stapler, tape dispenser, a notepad, file folders, file organizers and the cute little canister of push pins and paper clips. I gave everything a touch of color with the two rolls of masking tape. I LOVE how it all quickly came together. When I suddenly thought about her iPad! Allison’s school made the switch to all iPads last year, meaning they no longer have text books, all students have iPads. You know iPads only come in black or white, so what better way to make her iPad stand out than customizing it with a little fun and colorful tape! I little iPad makeover, if you will!! This is a quick and easy way to transform the look of your iPad or any tablet. When you are ready for a new look, just change the tape for a whole new look! Place decorative tape around the edges of the screen, overlap at corners. You can leave a small gap for the front facing camera, or carefully make a hole with a utility knife. 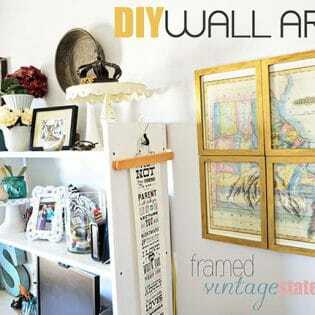 Fold tape over edges. Carefully use utility knife to trim around home button. Don’t forget to add a little tape to the charger as well!! This is especially handy when everyone at school is charging devices, she can now quickly spot her charger and iPad!! 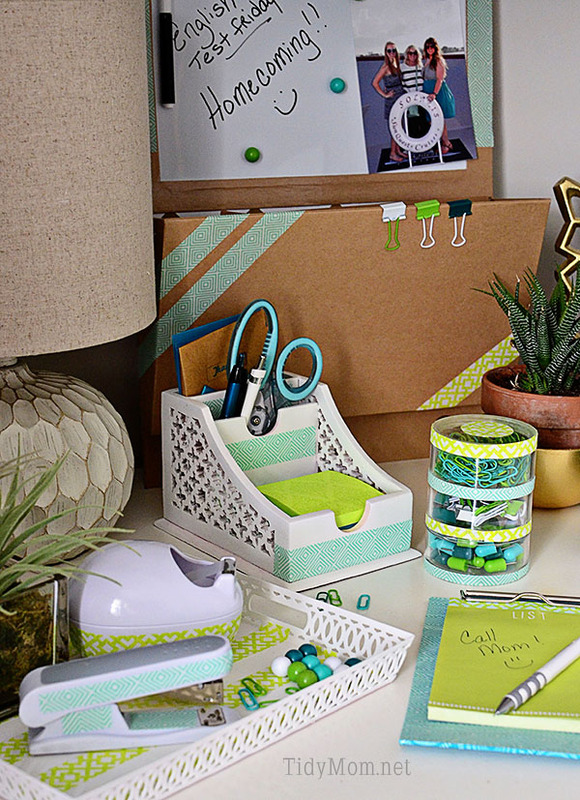 We are both in love with how a little tape gave her a stylish work station! and the best part is…..she can take most of these desk accessories to college with her next year! Wonder what colors she will change them to! 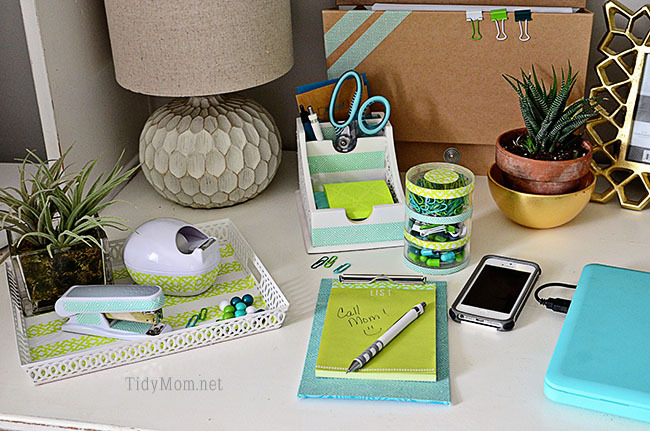 What is your favorite way to get organized for back to school? Disclaimer: This post is sponsored by Scotch Expressions. As always, all opinions and ideas are 100% mine. Love the color! May have to get some to do my tablet! Super cute! I love the color combination Cheryl! Adorable. What a great place to study! I absolutely LOVE this idea! The color theme is so me! I had no idea Scotch made Expressions Tapes – gotta find them!! Thank you for sharing, Cheryl! 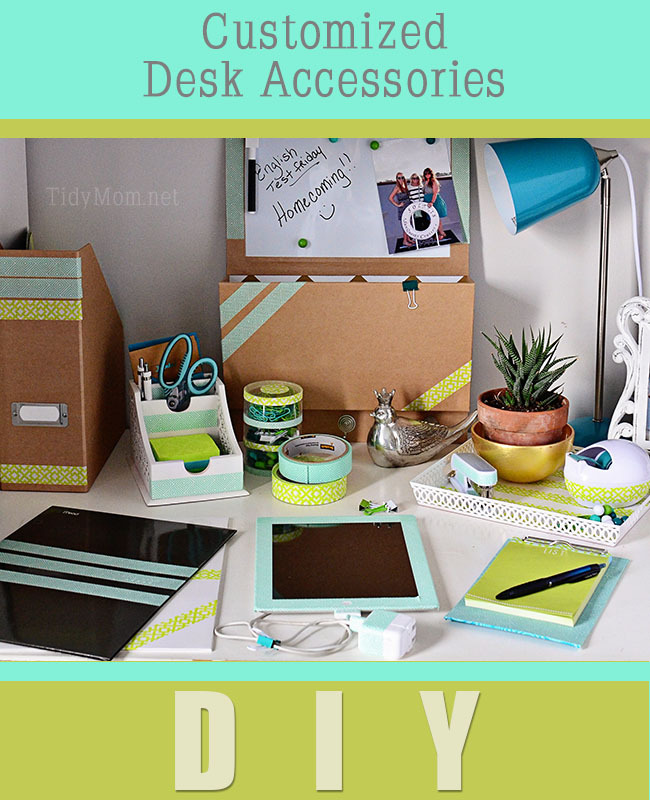 Love all the fun desk accessories & I love that idea of tape for the ipad! so smart. Love this, Cheryl – you are so creative! Thanks for the great ideas! Cute, cute!! Love these ideas! Fun! I love the colors! I love these! I saw the huge selection at Staples and it made me squeal! Love washi tape and what you did with it. Love what you did with the tape!! Loving it all matching!! Super cute!! I love your projects!! I picked up a couple roll of this tape last week just because I liked the colors. Now I have some really cute ideas to use them! Thanks, Cheryl! I love the colors and way you used the tape! What a fun way to make your school supplies really cute! Love the fun designs and bright colors! I never would have thought of customizing an iPad this way, great idea Cheryl!